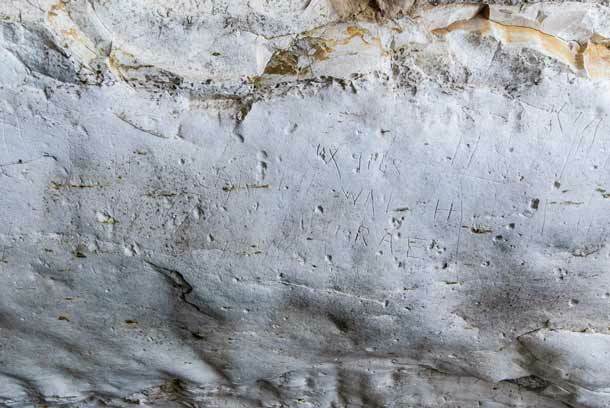 Archaeologists excavating an Israeli site housing a 2000-yr-old Mikve discovered graffiti left by Australian soldiers serving in WWII. A 1,900 year old ritual bath (mikve) was recently exposed at Ha-Ela Junction in excavations undertaken by the Israel Antiquities Authority and financed by the Netivei Israel Company, prior to widening Highway 38. An enormous 1,700 years old water cistern was revealed nearby in which graffiti was discovered that had been engraved on the reservoir’s ceiling by Australian soldiers during the Second World War. 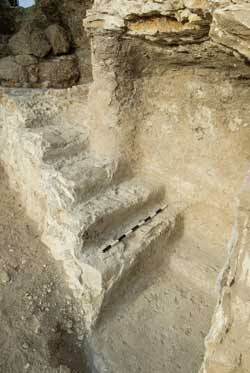 According to Yoav Tsur, excavation director on behalf of the Israel Antiquities Authority, “We exposed a mikve in which there are five steps; the fifth step being a bench where one could sit at the edge of the immersion pool. We found fragments of magnificent pottery vessels there dating to the second century CE, among them lamps, red burnished vessels, a jug and cooking pots. Apparently the mikve ceased to be used during the second century CE, perhaps in light of the Bar Kokhba revolt. A rock-hewn opening was exposed south of the mikve, which appears to have been the entrance to a large water cistern. It seems that in an early phase it was a smaller reservoir and functioned as the “otzar” (water collecting vat) for the mikve. When the mikve ceased to be used the cistern’s original cavity was increased to its current large dimensions and an extensive surface was built nearby which facilitated drawing water. During the course of the excavation the archaeologists were surprised to discover some contemporary yet intriguing finds: graffiti engraved on the ceiling of the cistern indicating the place had been exposed until the 1940’s. The inscriptions were read by Assaf Peretz, an archaeologist and historian with the Israel Antiquities Authority, who said, “Among other things, two English names were identified that are carved in the rock: Cpl Scarlett and Walsh. Next to the names are carved the initials RAE and two numbers – NX7792 and NX9168. The date 30/05/1940 appears below the graffiti. Since the initials Cpl signify the rank of corporal, we can assume that these were soldiers who wanted to leave their mark there. An inquiry with the proper authorities revealed that the numbers engraved inside the cistern are actually soldiers’ serial numbers and that RAE stands for Royal Australian Engineers. A search in the Australian government archives revealed the following information: Corporal Philip William Scarlett was born in Melbourne in 1918, was drafted into the army in 1939, survived the war and died in 1970, shortly before his fifty-second birthday. His comrade, Patrick Raphael Walsh, was born in 1910 in Cowra, was drafted in 1939, survived the war and passed away in 2005 at the age of 95. It seems that the two were members of the Australian Sixth Division which was stationed in the country at the time of the British Mandate and was undergoing training prior to being sent into combat in France. Because France surrendered before the troops were ready they were ultimately sent to Egypt in October 1940 where they fought at the front in the Western Desert”. The archaeologists added, “If the relatives of these people are acquainted with the story, we’ll be happy if they contact us and we’ll share with them the warm greetings left behind by Scarlett and Walsh”. Peretz adds, “The fins of British mortar bombs were found while searching the site, as were twenty-seven rifle cartridges, six of which were manufactured in Australia and fired in the region”. According to Tsur, “The finds from this excavation allow us to reconstruct a double story: about the Jewish settlement in the second century CE, probably against the background of the events of the Bar Kokhba revolt, and another story, no less fascinating, about a group of Australian soldiers who visited the site c. 1,700 years later and left their mark there”. Pablo Betzer, the district archaeologist for Judah of the Israel Antiquities Authority, points out that in the wake of the discovery the Israel Antiquities Authority requested that Netivei Israel Company modify the junction’s construction plan in order to preserve the finds there and rehabilitate them as part of the landscape alongside the road. The Netivei Israel Company has agreed to so.